The Works Team Aston Martin car known as “LM3” belongs to a highly select group of just seven bespoke motorcars made by the best craftsmen at Aston Martin between 1928 and 1931 to compete in international races including Le Mans, where the chassis number designation derived from, as part of the Aston Martin Works Team. The Company director A.C. “Bert” Bertelli raced LM3 himself. He was one of the very few motor manufacturers who actually raced his own cars, and therefore was well placed to modify his designs. His mantra was “Racing improves the breed” believing that to be successful in motorsport aided product development of the road cars through the hard lessons learned on the track and that additionally winning races was good for the overall brand image of the road vehicles. Every engine for these cars was built, dyno tested, stripped to check for problems and re-built prior to being fitted to the car, similarly worm-and-wheel type rear axles were built by just one man and dyno tested on purpose built rig. The entire unit was then stripped to check for wear or defects prior to being re-built. These were extremely expensive motorcars, their exacting manufacture meant that they were “built twice”. Under the stewardship of Bert Bertelli this hand-crafted group of cars competed in and won awards at numerous International events including Le Mans, Brooklands, and Phoenix Park in Ireland. LM3, is a most significant car, historically speaking, heralding the new “sports Model” lightweight racing design, the third of the Works Team Aston Martin cars and the only Team car built in 1929. 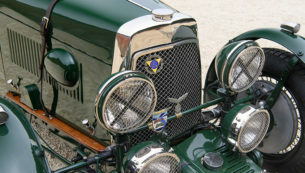 It was built as a pure racer and therefore extreme effort was exerted to make it much lighter than previous models with many parts produced in aluminium rather than the normal bronze. Initially it was fitted with a full lightweight two-seater pointed-tail racing body with no doors and a horizontally mounted spare wheel strapped on top behind the passengers. The wings were of a simple cycle pattern with no valances and having been fully tested in the English motoring press it had its track debut in the first ever Double 12 Hour meeting at Brooklands with Bertelli and chief mechanic Jack Bezzant sharing driving duties finishing a creditable 5th. They then entered the Irish Grand Prix finishing 9th and Bezzant entered with the car the RAC Tourist Trophy again in Ireland where he failed to finish. This lightweight body presumably was too light as after the it was changed by the factory in 1930 and raced again by Bertelli in the Brooklands Double 12-Hour race and the Irish Grand Prix before the car became the Works Team Aston Martin development and road test car, lent out to journalists to drive and report on. In 1932 the decision was made to sell it to Peter Farquarson, the chassis was stamped with the additional number 129R , the present body fitted and the car re-registered GX599. In this guise Farquarson drove it in the 1932 International Relay Race at Brooklands and other events before selling it to St John Horsfall who entered it in 1935 in the five lap handicap race at Donnington Park where he took the first of his many wins in an Aston Martin. 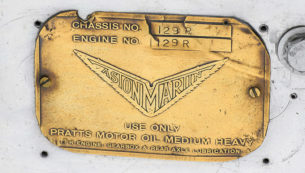 The Aston Martin factory service cards record that in 1939 the car had been sold to R. Churchill of Number 1 Broad St. London and that he had sold the car to David Elwell-Smith in June of 1963 It was subsequently sold to the well-known Aston Martin historian Jim Young who was able to confirm during the exacting restoration carried out in his ownership that the chassis, engine, running gear and coachwork were all correct and original. Retaining the body fitted by Aston martin prior to its sale to the public and accepted by the Aston Martin Owners Club as the first of the Le Mans models the car has been accepted by the organisers of the Mille Miglia and carries a co-efficiency of 1.65. LM3 is one of the first cars to be entered in the Aston Martin Factory assured provenance programme where its certification level was Gold. In the words of the factory “a Gold certified useable vehicle is probably more desireable than a Platinum certified vehicle that’s performance may be limited”. First in class at the prestigious Amelia Island Concours D’Elegance, exhibited at Pebble Beach and entrant in the last three Mille Miglia’s. LM3 is a valued entrant to any significant motoring event and offered with the car are two sets of wings and two sets of wheels and tyres and a comprehensive history file detailing its important history. A current Fiva passport and old FiA papers are also present. 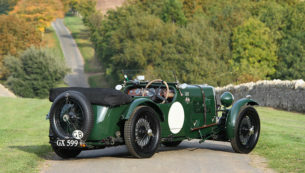 Apart from the numerous road tests carried out on the car in the 1930’s it has more recently been the subject of articles in Vintage Racecar and the independent Aston Martin magazine Vantage. The opportunity to buy such an important Works Team Aston Martin car rarely occurs and we are therefore immensely proud to offer such a car and urge early inspection.